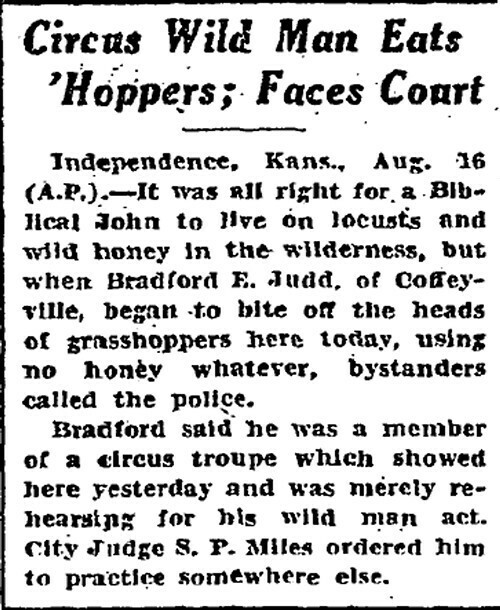 Washington Post, August 17, 1929. Rehearsing for his act and doing a little advance publicity work too, I'll warrant. If I'd been this guy's counsel, I'd have thrown Leviticus 11:22 in the judge's face: "Even these of them ye may eat; the locust after his kind, and the bald locust after his kind, and the beetle after his kind, and the grasshopper after his kind." The Good Book could not be clearer on the point: Grasshoppers are unequivocally on the dad-gummed menu. This fact tends to get overlooked nowadays when people write faith-based diet books like this one, which is all about whole grains, olive oil and fresh fruit, with nary a single entomophagic entry. Truly, we have strayed from the path of dietary righteousness.